We’ve been playing around with a lot of different ways to paint on knit fabric lately. With the School Bus/Metro T-shirts and the Field Trip Raglan T-shirt patterns, it’s so much fun to work with knits that I just couldn’t resist decorating the fabrics themselves to see what could be done. And there’s something about hand-printed or painted fabrics that really appeals to me, especially because I prefer really simple designs that can be difficult to find. So when S fell in love with her pale gray T-shirt made with Kaufman Laguna jersey, I thought it might be fun to decorate it a little bit. Light-skinned blond girls can sometimes use a little more color in their lives beyond pale gray, you know? We stopped by the art store and purchased this Jacquard Textile Color, and we used a craft knife to cut a star shape from an eraser to make a stamp. It was really fun for S to stamp the T-shirt because she could decide where she wanted each star to be positioned. I’m sorry I don’t have a photo of her wearing it. Her wearing schedule and my camera just haven’t coordinated yet. I’ll try to post a photo to Instagram one of these days. Meanwhile, I was remembering this T-shirt that Disney of Ruffles and Such decorated for her daughter, inspired by Oliver Jeffers’ Heart in the Bottle book and sewn for Katy’s Once Upon a Thread series. I bought transparent fabric paint and went to town on old T-shirt of mine, just to see what would happen. Verdict: if you want to paint stripes, it’s much easier to do before you sew the fabric. 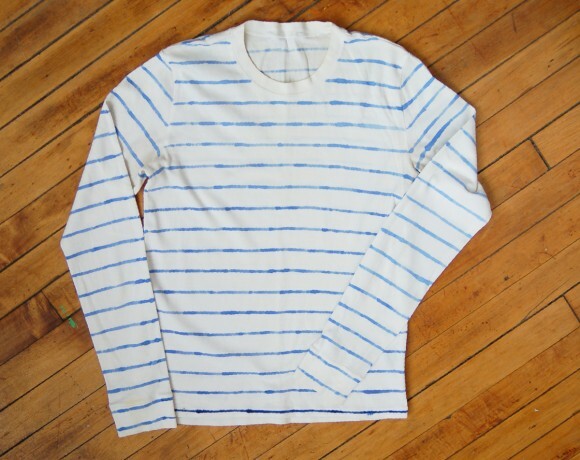 The sleeves were particularly challenging to paint evenly. Still, I love the watercolor effect and will be playing around with this technique more in the future. I diluted the paint with water before starting, and I used a ruler to help me keep the lines as straight and even as possible while I was painting. If you try this, be sure to put a piece of plastic or cardboard behind your fabric to prevent the color from bleeding through to the other side of the T-shirt or onto your work surface. Otherwise there’s not much to it! 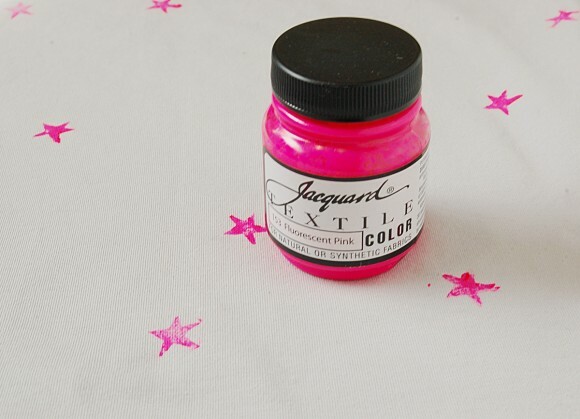 Have you tried painting or stamping on knits? Please tell us about your experience! The only time I paint on knit is when working with my daughter at Christmas to make a reindeer shirt from her foot and hands (although, at 5 she might soon be getting “too old” for this). I should try it more often, as I always enjoy doing it with her. I love using a stencil and silkscreen to print onto jersey already, so this seems like it would be a natural extension of that. 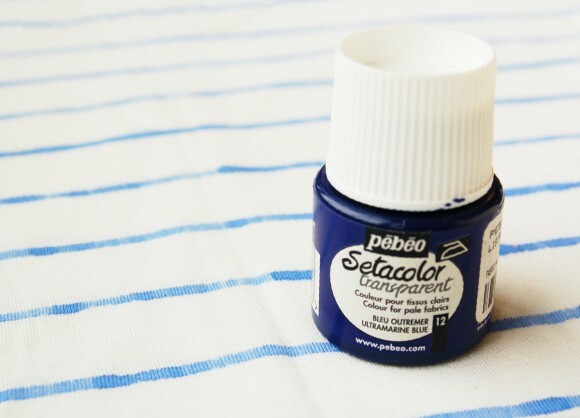 I have the Pebeo paint already (thanks, Lotta Jansdottir!) so I’ll have to try this out, love the look of the watercolor. Do I ever love to paint on T-shirts! Like the watercolour effect here and must remember to try this one day.